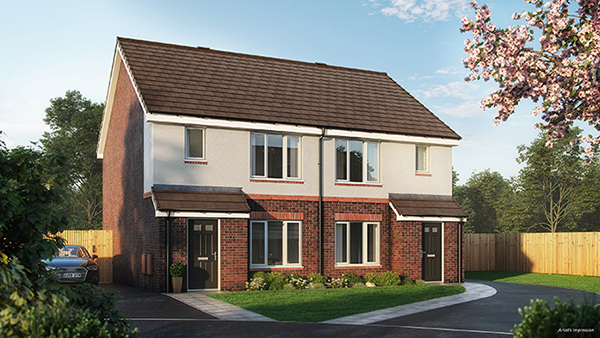 Work has started today (25 March 2019) on a £7.3 million housing development in Wythenshawe, south Manchester. Warrington-based housing provider, Your Housing Group, is building 52 two and three bedroom houses on Amberley Drive. Sixteen properties will be available for shared ownership and the remaining 36 will be available for rent via Nuvu Living, Your Housing Group’s private rental brand. The Amberley Square development benefits from good local amenities including schools, medical facilities and shops. Wythenshawe is well served by public transport links, close to the motorway network, Manchester Airport, The University Hospital of South Manchester and a short drive to Manchester city centre. Designed by Manchester architects MHA, and being built and delivered by energy and regeneration specialist ENGIE, the scheme offers a range of detached and semi-detached properties all of which have off road parking for two cars and front and rear gardens. Lorraine Donnelly, Director of Development for Your Housing Group said: “Amberley Square is ideal for first time buyers, young professionals and growing families. “With a choice of detached and semi-detached homes, the new development will provide quality homes for those looking to settle down. Its proximity to Manchester Airport, Wythenshawe hospital and a number of high schools and academies makes it an ideal location. Your Housing Group became one of Homes England’s Strategic Partners earlier this year. This development is part-funded with a £560,000 grant from Homes England’s current Shared Ownership and Affordable Homes Programme. Steven Gregory, Head of New Build at ENGIE, said: “Your Housing Group is one of our long-standing partners in regeneration across the country and together we have completed a number of flagship projects in housing, new build and retirement living. “We’re delighted to kick start this project. These new rental properties will be a fantastic addition to Wythenshawe, offering a prime location for tenants while helping to regenerate the local community. The first homes will be built by the end of November this year and the whole scheme is scheduled to be completed by the end of May 2020.